Aircraft flying from Europe into London Heathrow Airport now benefit from more accurate delay information thanks to the advanced data available from NATS’ Arrival Manager system (AMAN). Deployed on 19 September, the data feeding into AMAN now comes from the point at which aircraft push back off the stand (within the Extended AMAN horizon) and not from the previous point, which was take-off. This gives both aircraft and controllers even more advanced delay information and should reduce the time aircraft spend holding in one of the Airport’s four stacks. AMAN, the system behind Cross Border Arrival Manager (XMAN), provides automated sequencing support to controllers handling traffic arriving into Heathrow. When delay in the airport’s holding stacks is forecast to reach seven minutes, aircraft within the XMAN speed reduction horizon (350NM) are instructed by air traffic controllers to reduce their speed. Aircraft still arrive at the airport at their scheduled time, but spend more time cruising at a higher altitude and less time in the hold, reducing fuel burn and emissions and easing congestion in the London Terminal Manoeuvring Area (TMA). Based on our data analysis from January/February 2017, the annualised stack hold fuel burn saving equates to approximately 3.57kt fuel or £1.82m per year. 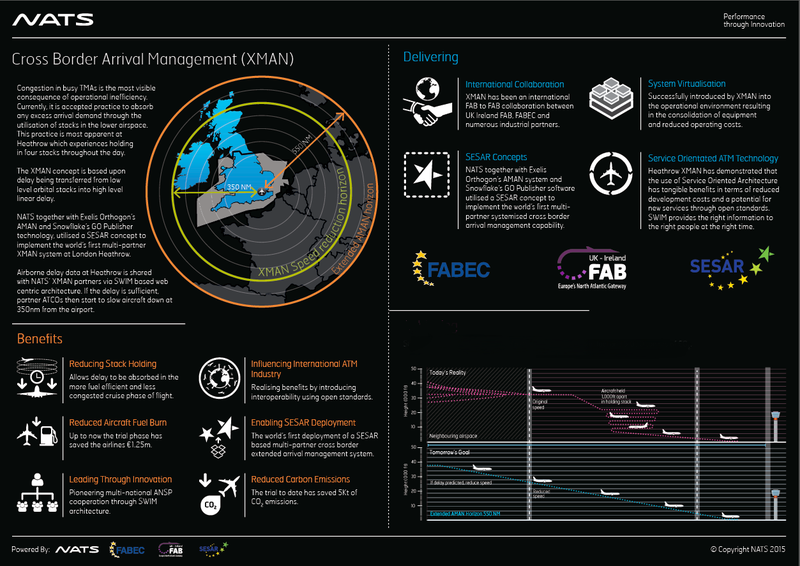 NATS is continuing to work on enhancing and refining the Extended Arrival Manager concept, in partnership with fellow ANSPs and industry partners, through the SESAR 2020 programme.